Benjamin West (1738–1820), General Johnson Saving a Wounded French Officer from the Tomahawk of a North American Indian (c 1764-68), oil on canvas, 129.5 × 106.5 cm, Derby Museum and Art Gallery, Derby, England. Wikimedia Commons. When Benjamin West was born in Springfield, Pennsylvania, in 1738, the edge of European ‘civilisation’ was only a hundred or so miles to the west. As the tenth child of an innkeeper, his prospects didn’t include becoming the most famous history painter of his day, living most of his career in London, painting commissioned works for the King of England, or being the second President of the Royal Academy in London. West had little formal education, limited training in painting, and almost no knowledge of classical history or mythology. 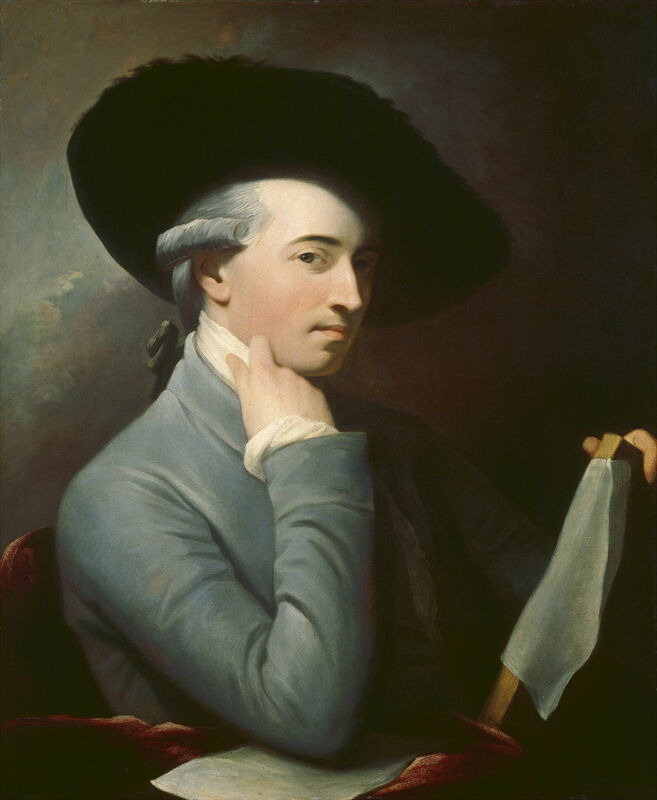 Quite how he became the eminent artist that he was when he died in 1820 is not particularly clear either: the most detailed contemporary account of his life and work was written by a novelist, John Galt, who compiled an entertaining collection of anecdotes and unreliable stories. Without doubt, West had ambition, and his specific ambition from quite early in life was to become a great history painter. Even when he moved to Philadelphia, then growing to reach a population of 20,000, making it the largest city in the British colonies, opportunities seemed very limited. He learned to paint with the help of various local artists, and by the mid 1750s was painting quite decent portraits. 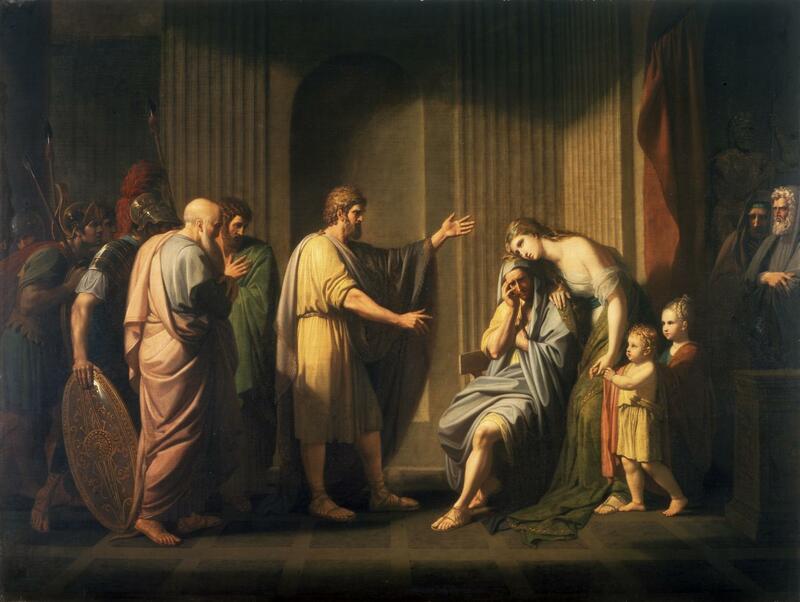 His first attempt at a history painting, showing the death of Socrates, was based on an engraving of the event, but had much more originality than a mere copy. From the help he got from local artists and his own study of some instructional books, his painting was good enough to convince a group of wealthy Pennsylvanians to sponsor his travel and stay in Italy, to improve his art. From 1760 to 1763, West copied the classics, and learned further from Neoclassical painters such as Anton Rafael Mengs, and Gavin Hamilton. He had his share of problems too: he suffered quite disabling infection in his leg, which required some surgery to settle it down – in days long before anaesthetics, aseptic technique, or antibiotics. In 1763, West started on his journey back to Philadelphia, intending to visit London for a short while on the way. He stayed for nearly sixty years. As in Italy, his distinguished sponsors had provided valuable introductions, and from those he met Richard Wilson, a great landscape painter who was the founding father of art in Wales, and his then student, Joshua Reynolds, soon to be the first President of the Royal Academy. West settled in Covent Garden, in the heart of London, and in 1765 married his fiancée from Philadelphia, at one of the quintessentially London churches, Saint Martin-in-the-Fields. Benjamin West (1738–1820) (copy after), Self-portrait (c 1776), oil on canvas, 75.8 x 63 cm, The National Gallery of Art (Andrew W. Mellon Collection), Washington, DC. Courtesy of The National Gallery of Art. This copy of West’s Self-portrait dates from about 1776, but may be based on a slightly earlier original. West painted portraits to pay the bills, and history paintings for his art. King George III not only became West’s most important patron, but the pair became good friends, the King reading from translations of the classics to fuel West’s history painting. West was involved in the birth of the Royal Academy in 1768, although at that stage he was one of the leaders of a rival group, the Society of Artists of Great Britain, founded in 1760. This allowed Joshua Reynolds to become the first President of the Royal Academy. In the late 1760s, West launched his career as a history painter with a succession of ambitious works. 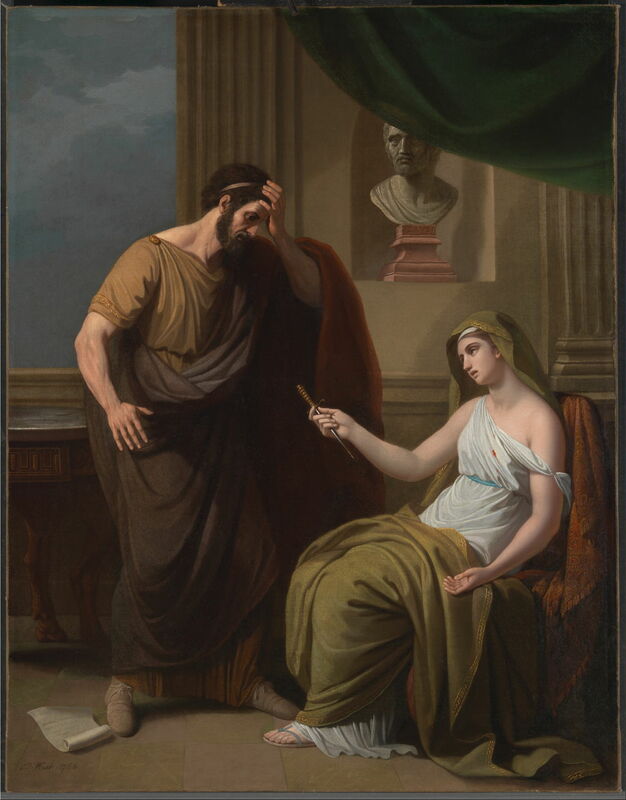 Benjamin West (1738–1820), Cymon and Iphigenia (c 1766), oil on panel, 61.3 × 82.6 cm, Yale Center for British Art, New Haven, CT. Wikimedia Commons. 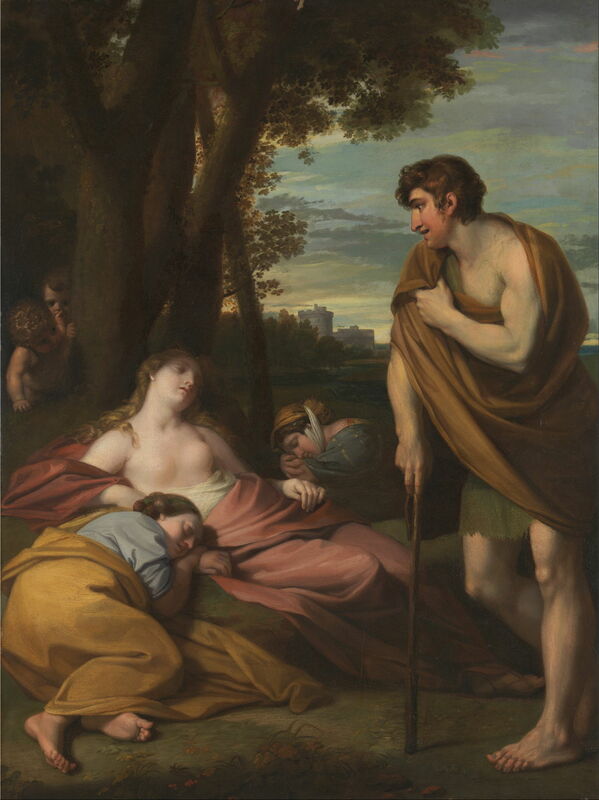 Although Cymon and Iphigenia (c 1766) might sound to have been based on purely classical myth, and is derived from the stories around Orestes, West’s source was almost certainly Boccaccio’s retelling in The Decameron. He shows the beautiful Iphigenia asleep at the edge of a wood, as the ill-mannered and loutish Cymon comes across her. He is so captivated by her beauty that he is transformed into a noble polymath – the transformative power of real beauty. West conveys this simple narrative very effectively, and it is not surprising that this work was well-received at the time. Over a hundred and twenty years later, Frederic, Lord Leighton, enjoyed success with his far more modern version. For West, its story may have had personal attractions in his own ambitions from very humble beginnings. Benjamin West (1738–1820), Paetus and Arria (1766), oil on canvas, 108 x 87.9 cm, Yale Center for British Art, New Haven, CT. Wikimedia Commons. Paetus and Arria (1766) shows a more obscure tragedy from Roman history, recorded in Pliny the Younger’s letters. Caecina Paetus was one of the senior members of a failed rebellion against Claudius in 42 CE, who was effectively condemned to death by the emperor. He was given the option of committing suicide, or ‘falling on his sword’, and his wife Arria intended joining him. When Paetus proved incapable of stabbing himself with his own dagger, Arria took it from him, stabbed herself, and handed him the dagger saying that it didn’t hurt! This is the scene which West depicts, in plain style, giving it a starkness appropriate to the story. He is very sparing of blood, compared for example to well-known paintings of Lucretia’s suicide. Although it has been claimed that West painted Pylades and Orestes Brought as Victims before Iphigenia ‘immediately on his arrival in England’, it was not shown until the annual exhibition of the Society of Artists of Great Britain in 1766. It forms a pair with The Continence of Scipio, which I am unfortunately unable to show here. The story is based on Euripides’ play Iphigenia in Tauris, which is concerned with myths surrounding the tragic figure of Orestes, and his mother Clytemnestra. 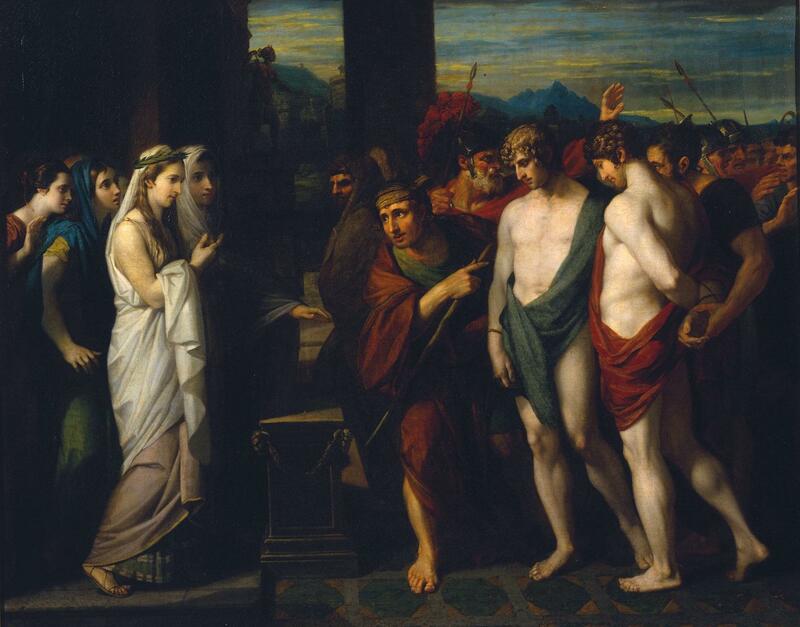 In this scene, Orestes and Pylades, his cousin, are prominent in the right foreground. They have been brought before Iphigenia, a priestess of Diana, prominent in the left foreground, who stands in judgement over them. Following his matricide, Orestes was told by the Oracle at Delphi to make reparation by returning to Delphi the gold statue of Diana, seen in the distance slightly to the left of centre. In attempting to seize and remove that statue, Orestes was committing an act of sacrilege, for which he and Pylades are to be sacrificed on the low altar between the priestess and the young men. West sold this painting for over a hundred pounds (100 guineas), but later in life bought it back, only to sell it on to Sir George Beaumont, the collector and patron of Constable. 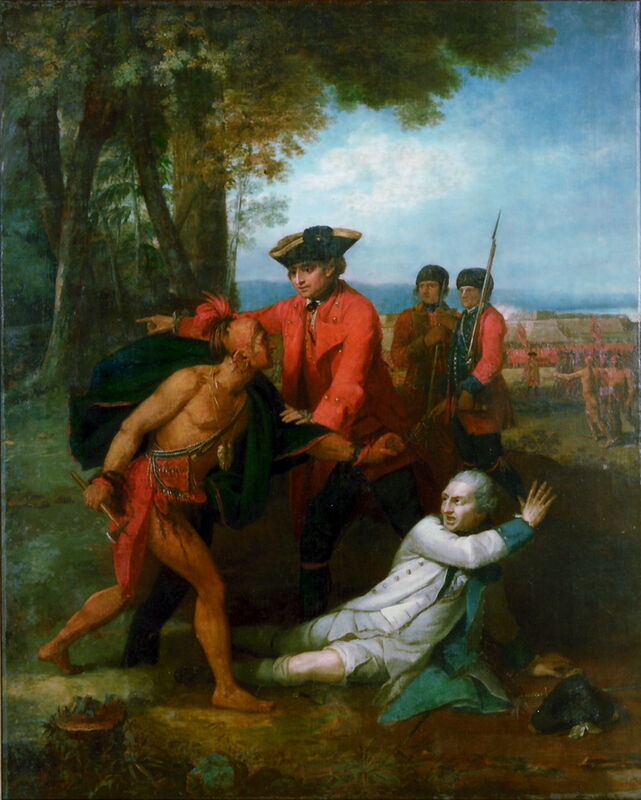 Although most of West’s early history paintings were based on narratives from ancient Greece and Rome, another of these tackled a much more contemporary event: General Johnson Saving a Wounded French Officer from the Tomahawk of a North American Indian (c 1764-68). This painting shows what was then a well-known act of honour, in the Battle of Lake George, which took place in the north of New York on 8 September 1755. It was fought between French and allied troops under the command of Baron de Dieskau, and British colonial troops and Mohawks under General William Johnson. Although West does not name the French commander, it is generally thought that his painting shows an incident in which Johnson is claimed to have saved the life of Dieskau, who had been wounded, and paid the price of leading from the front. When one of the Mohawks came up to claim Dieskau’s scalp, Johnson is alleged to have stopped him, and saved Dieskau’s life. This initial foray into painting modern history seems to have worked well, with a simple composition and clear differentiation between the parties. As Dieskau had been shot through the bladder, West has once again avoided showing any gore. West returned to the classics in Cleombrotus Ordered into Banishment by Leonidas II, King of Sparta (1768), a neo-classical frieze which was shown at the second exhibition of the Royal Academy. This is another obscure story drawn from Plutarch’s Lives, about rival kings of Sparta in about 240 BCE. When Leonidas II was on the throne, Cleombrotus (sometimes referred to as Cleombrutus) married the king’s daughter, Chilonis, who was half Macedonian and half Persian. There was friction over the succession to Leonidas, and when the latter fled to avoid trial, Cleombrotus assumed the throne. Leonidas later returned, and sought revenge by putting his son-in-law and usurper to death. West shows Chilonis pleading Cleombrotus’ case before Leonidas, a speech so moving that the couple were sent into exile instead. Leonidas sits on a suitably Spartan throne and his daughter leans against him, and holds the hand of one of his grandchildren. The king averts his eyes from Cleombrotus, who is gesticulating towards his wife. West’s major breakthrough, the painting for which he is still renowned, was to come in 1770: The Death of General Wolfe. Text and other versions of the two volumes are available for download from Project Gutenberg. Posted in General, Language, Life, Painting and tagged Hamilton, history, Mengs, myth, narrative, painting, Reynolds, West, Wilson. Bookmark the permalink.